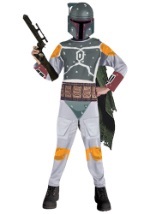 Travel through the galaxy and earn a reputation for being the best bounty hunter in this kid's Jango Fett costume. It includes a half, PVC character mask that is secured in place with an elastic band and has slits for unrestricted vision. The mask matches the blue, polyester jumpsuit that has screen-printed armor that is grey and a brown belt. It velcros at the back of the neck for a secure fit. Add our Jango Fett backpack and blaster for an authentic Star Wars look.